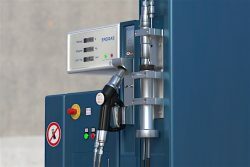 WEH GmbH, a leading manufacturer in fluid systems connection technology based in Illertissen, Germany, designs products to enhance the safety and functionality of the expanding global CNG filling station network for self-service operation. The recently introduced WEH® breakaway couplings, also available for hydrogen stations, can offer a substantial additional safety factor at these stations. In the event of accidental deployment, e.g. driving a vehicle from the dispenser with the nozzle remaining in the vehicle fuel port, the breakaway coupling cuts off the connection between the dispenser and the CNG hose in a controlled manner. Both ends of the break are sealed by the breakaway mechanism, preventing any natural gas from escaping into the environment. This ensures the highest possible level of safety for the operator but also guarantees that service station components are protected. The mechanism prevents damage to the vehicle fuelling receptacle, the fuelling nozzle and the dispenser as far as practically possible. WEH provides a number of different breakaway couplings for private car filling stations as well as bus and truck filling stations, both for direct installation between the dispenser and filling/recirculation hoses and for inline breakaway couplings for installation between the filling and recirculation hoses. The breakaway couplings conform to the ANSI NGV CSA standard. In addition to the requirements of the CSA standard, WEH has added another safety feature to their breakaway couplings, by fitting an additional shut-off valve. This closes off the pressurised filling hose after the break-off, thus minimising the safety risk to the operator. The equipment prevents any uncontrolled gas leak allowing the filling hose to be vented in a controlled and deliberate manner in a secure environment. The breakaway couplings are also supplied with integrated filters for added safety benefits. These filters ensure that the natural gas is clean, thus protecting the components from soiling. The filter inserts are easy to change to minimise dispenser downtime. After break-off, WEH breakaway couplings can be reused after a leak test without any need for factory re-servicing.